Welcome to the Great Basin Equine Online Pharmacy. For our clients' convenience, we are offering an easy way to order select prescription medications for your horses at a discounted price. Items ordered are available for pick-up or delivery. Orders over $60 will receive free shipping. Prescriptions will be filled for patients that have a current veterinarian-client-patient relationship (VCPR). In order to receive the discounted prices, payment is required at the time of pick up or ordering if shipping. Pick-up items will be available the next business day. To place your order, email the Pharmacy. If you are having your items shipped to you, please call the office with your payment information. 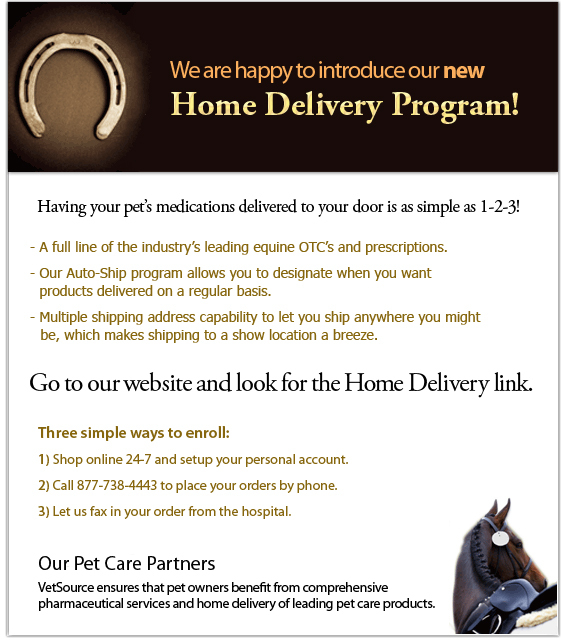 We are also continuing to offer Vet Source Home Delivery as an outside online pharmacy option. Please allow 24 hours for prescriptions to be approved.